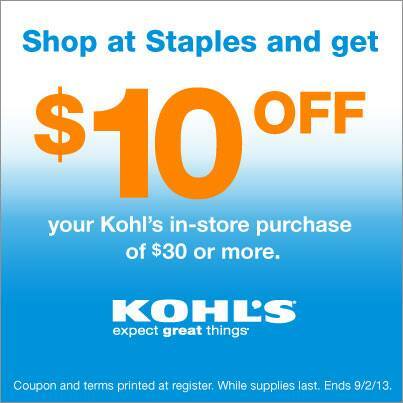 Kohl’s $10 off $30 Purchase from Staples! Make a purchase at Staples (think school supplies) and your receipt will print out a coupon for $10 off any $30 purchase at Kohl’s. School supplies and clothes….Yep, it’s that time of year again! Visit Staples.com for details. Previous postSan Antonio "KIDCATION WEEK" (8/12 – 8/18) Huge List of Savings on Hotels, Attractions and Food!